​Organized in 1938, Soquel Pioneer and Historical Association is a community organization that sponsors an annual picnic each July to commemorate the town’s history and its role in the development of Santa Cruz County. There are no membership restrictions. Everyone interested in sharing and preserving Soquel history is invited to participate in the annual picnic celebration that keeps the past alive. We also maintain a History Room at the Porter Memorial Library on Porter Street. The room is open to anyone who wants to explore Soquel history through displays. books and scrapbooks. 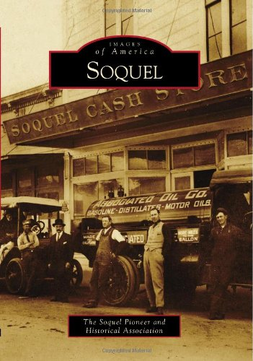 The Soquel Pioneer and Historical Association committee worked four years to create a history of Soquel. The long-awaited book is part of the Arcadia Publishing Company Images of America Series. It may be obtained for a donation of $22 at the Soquel Porter Memorial Library. The book includes many of the pictures archived in the Pioneers library. As a gift to Soquel, Stan Stevens, Librarian Emeritus at the University of California, Santa Cruz, compiled an index that is now available for the cost of printing, $3. with the book purchase. Each year, the Pioneers sponsor a potluck picnic for the community on the last Saturday in July. The picnic begins at 12:00 noon. Come at 11;00 to listen to the music of The Open Heartstrings, an old time string band with fun instrumentals by banjo, fiddle, guitar and bass and to meet and greet old and new friends and to enjoy the photos and scrapbooks provided by the pioneers. We hold a raffle featuring items donated by local merchants. The highlight of the afternoon has always been a talk by a local historian. Please bring a potluck dish. Admission of $5.00 per adult $10 for a family helps defray the costs associated with the picnic. jumping aboard a sailing ship and making a 4 month journey across the oceans to San Francisco. future Soquel postmaster Lloyd Pringle were all staking their futures on living and thriving in early California.